They may look like lizards, but salamanders are actually amphibians. These scaleless, highly aquatic creatures, which evolved around 150 million years ago, can be mostly found all across the Holarctic ecozone -- an area that includes most of North America and Asia, all of Europe and the northernmost parts of Africa. There are more than 400 known salamander species still in existence, including newts, and although some characteristics are shared by many, some species are unique. Probably the most telling difference between salamanders and other amphibians is the presence of a tail that stays attached through adulthood. All salamander tails are laterally compressed, meaning they are taller than they are wide. And some species even feature prehensile tails that can grasp onto branches -- the way possums do. The respiratory organs among various salamander species come in three different forms. Aquatic salamanders typically breathe through a set of gills. Some of them feature internal gills that receive dissolved oxygen via gill slits. Others feature external gills that flare out like a set of tiny wings, while still others feature a combination of internal and external gills. Many terrestrial salamanders breathe oxygen via a set of regular, internal lungs. However, even most of these species breathe through gills while in their larval forms. The third type of salamander respiratory organ is actually the skin; Plethodontidae, commonly known as lungless salamanders, are the largest family of salamanders, and every one of them simply absorbs oxygen through their skin or membranes of the throat and mouth. Most salamanders feature four short legs of roughly equal size that extend from the sides of their bodies. However, at least two species -- the greater siren and lesser siren salamanders -- have only a pair of front legs. Typically, a salamander’s front legs each contain four toes, and its rear legs -- for the majority of species that have rear legs -- each contain five toes. Some salamanders, specifically the three, eel-like amphiuma species, feature only one, two or three toes per leg. Salamanders, like the majority of other amphibians, are relatively small vertebrates. On average, most adult specimens grow to around 4 to 8 inches in length. However, a few species can grow quite large. For instance, the Chinese giant salamander can grow to lengths of up to 6 feet, making it the world’s largest extant amphibian. Salamanders come in a wide variety of colors. Some species, such as the siren salamanders, are a plain olive or black color. In a few species, only the males exhibit any bright markings. The majority of salamanders feature various bright coloration, including stripes, patches, strips and spots of all different colors. For instance, several different species, including fire-bellied newts and red-bellied newts, have bright orange or red bellies. 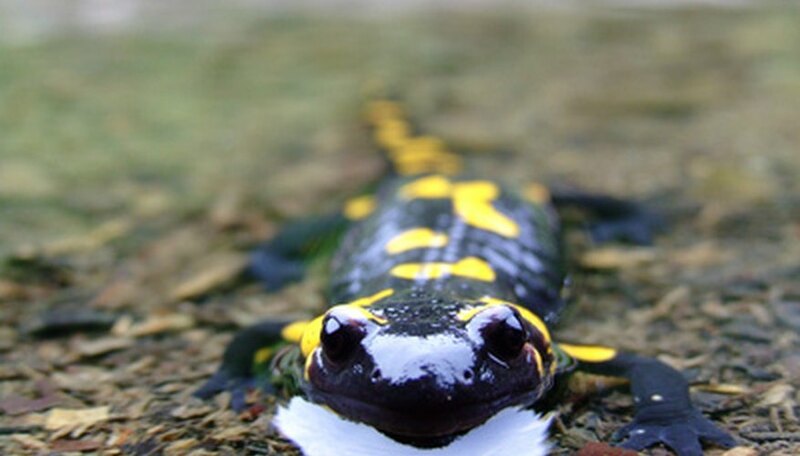 The spotted salamander features two rows of bright yellow spots along its back. Salamanders that live in subterranean caves or rivers are typically either pink or white. Miller, Carl. "Salamander Characteristics." Sciencing, https://sciencing.com/salamander-characteristics-7873616.html. 25 April 2017.